If you can believe it, Halloween is less than a week away! It’s time to start the finishing touches on your costume and get ready for any upcoming Halloween parties, and of course the big night itself, All Hallows’ Eve. If you still haven’t exactly figured out what you want to be for Halloween don’t fret! There is still time to put together a great costume! You could always go out and purchase a pre-made costume but those tend to be more on the expensive side and at this point all of the good costumes/costumes in your size might already be taken. Instead why not opt to make your own costume! This way you can personalize the costume, no one will have the same exact one as you and you’ll save some money in the process! Don’t be intimidated by the prospect of making your own costume, here are some quick and easy DIY costume ideas, perfect for a last minute Halloween costume on a budget! Escaped Convict: This prison style look is super easy to re-create, but don’t forget to add a little dirt to your costume to get that real escaped convict look! First off you’ll need a pair of white or light colored scrubs. Then you’ll also need a plain white t-shirt and orange dye. The first thing you’re going to do is dye your scrubs orange. After you dye them let them sit out overnight. Then, when you wake up the next morning, wash them to rid the fibers of any excess dye. Now all you need to do is put on your white t-shirt, then your dyed-orange scrubs along with a pair of plain black sneakers. Rosie the Riveter: This cultural icon makes for an extremely easy costume to make, not to mention a great homage to the American women who worked in the factories during World War II. All you need for this costume is a pair of dark blue jeans, a collared button down blue shirt, some boots and a red polka dot bandana! Make sure you roll up those sleeves and give your best flex to the camera. 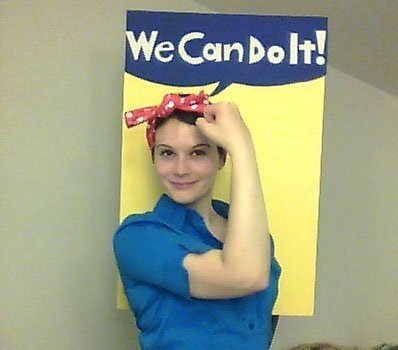 If you want to go above and beyond purchase yellow poster board from a local craft store, blue construction paper and buy large white letter stickers to create the, “We Can Do It!” sign behind her and just carry it around with you. Bag of Jelly Beans: Everyone knows Halloween is a time for eating candy but it can also be the time for dressing up like candy! All you need for this simple, inexpensive costume is a large clear trash bag, 3 packages of balloons, a picture of the Jelly Belly logo, and a rubber band or two. Cut holes into the bag where your legs would go and poke your legs through, then blow up all of the balloons about halfway (or else it’s impossible to sit in) and start filling up the bag. Then close it up by using the rubber bands to tie the top closed. Super Mario Brothers: This costume is great to do solo or as a pair! All you need is denim overalls, white gloves, a red long sleeve shirt, if you want to go as Mario, or a green long sleeve shirt, if you want to go as Luigi. Top it all off with a red, or green, plain baseball cap. Don’t forget to get a fake moustache and big letter stickers so you can stick a big “M” or “L” on your hat. Subject: LongIsland.com - Your Name sent you Article details of "Last Minute DIY Halloween Costumes"